OK!! Spring is on the way. 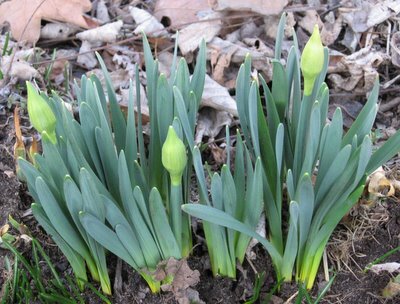 I loved seeing bulbs growing when I lived in the Midwest. I took pictures of the daffs that are blooming here. I think spring has sprung! You torture me! There are no signs of daffodils in Central Iowa! Those hars are binging right and left. The best thing about the daffodils all around the edge of our yard? They survive and bloom each year without my having to do a thing. My kind of flower! Yesterday I was shocked to realize that it was only 14 days until the first day of spring. Wasn't it just Halloween last month? "Those hars are binging right and left." I know I'm missing something here. . . So beautiful seeing bulbs growing! Here in my garden I struggle a lot against hungry ants. Sometimes I feel very discouraged about that. I must be always vigilant! They will be in bloom next week in Central Ohio. Your buds are huge!! Oh, one look at your photo and I'm homesick for the Ozarks! California still confuses me... it seems to be almost any season every day. all my daffs bloomed out and died already. and they were puny compared to those you have. Spring is near ... thank you so much! Oh yes, the first flowers of the spring. My daffodils are a little more late than yours.